I am officially in love with Giuliana and Bill Rancic's new L.A. home! After just welcoming baby Duke, they now have a perfect family home. Interior designer Lonni Paul created the space to fit the Rancics needs, and in my opinion, it could fit most everyone's! The nursery is definitely fit for a "Duke." I love the feel of this space -- navy combined with light blues and neutrals makes a perfect room that can transform from a baby's nursery to a boy's bedroom. The mirror opens up the space and also contributes to the room's nautical theme. The three-framed picture is a great touch as well. Check out this crib! It is personalized just for baby Duke, which is a really unique and personal touch for the Rancics' first child. I'm also a huge fan of the chevron pattern -- what a great rug! I can't say enough about this baby nursery. Lonni Paul created the perfect design -- complete with a couch! The color scheme continues throughout the house once you take a look at the family room. White and neutral furniture is a huge trend in interior design right now, and this is perfect. I love the navy accents in the room. It adds just the right amount of depth to create a "livable" looking space. The B & G initials on the wall are a great personal touch while the mirrors, lamps, and floral decor make the space relaxing and unique. The way Paul fixated the tv and entertainment area flows nicely with the rest of the room. I'm also a huge fan of that wood ceiling and recessed lighting. Check out this kitchen! Though I'm pretty sure it will be awhile before I design my own home, one thing I can't wait to create is a kitchen. I'm not too creative in my cooking abilities, but I do love to have a large amount of space to work with. The white cabinetry and wood ceiling really open up the space, the kitchen flows nicely into the "breakfast nook"/eating area. The dark flooring makes for a great contrast of the stark white of the room. 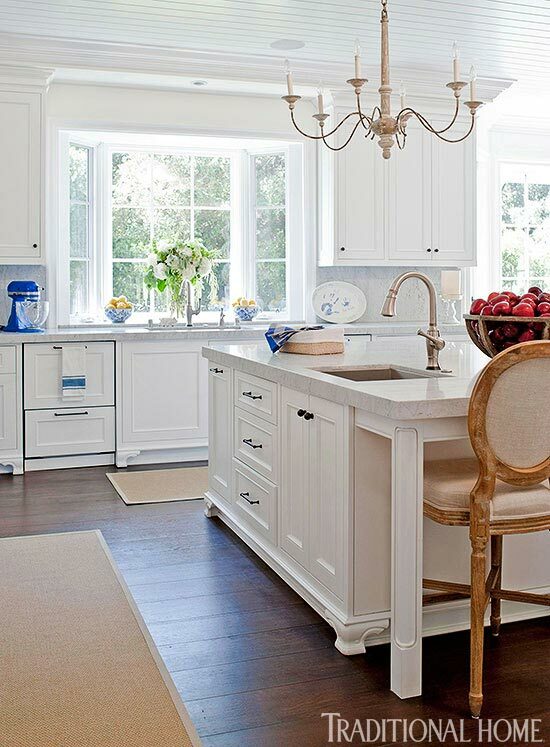 I also really like the light fixture above the table -- a great accent for this kitchen. Hope y'all enjoy the Rancics' home as much as I did! Check out the Style Network and E! Online for more photos of the Rancic home on Traditional Home.